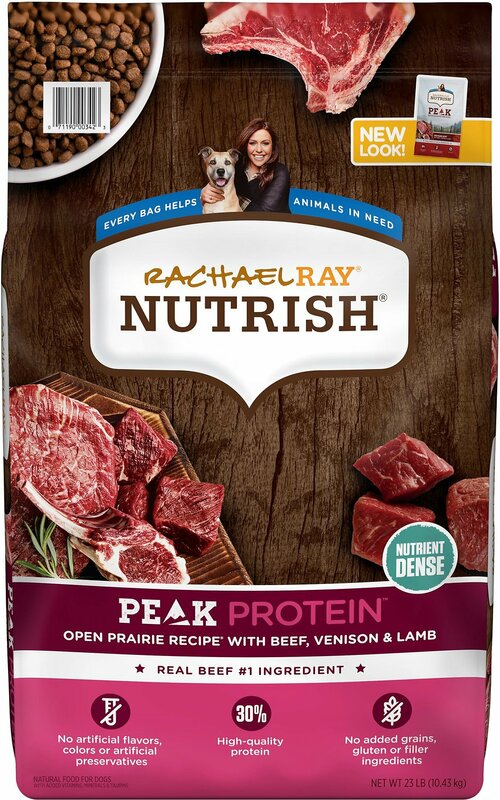 Rachael Ray Nutrish Peak Natural Open Range Recipe with Beef, Venison & Lamb Dry Dog Food is a delicious protein-rich recipe brimming with real venison, lamb and USA farm-raised beef as the #1 ingredient. It’s a hearty meal chock full of nutritious ingredients including peas, potatoes and cranberries. Plus, it’s free of gluten, grains and fillers. 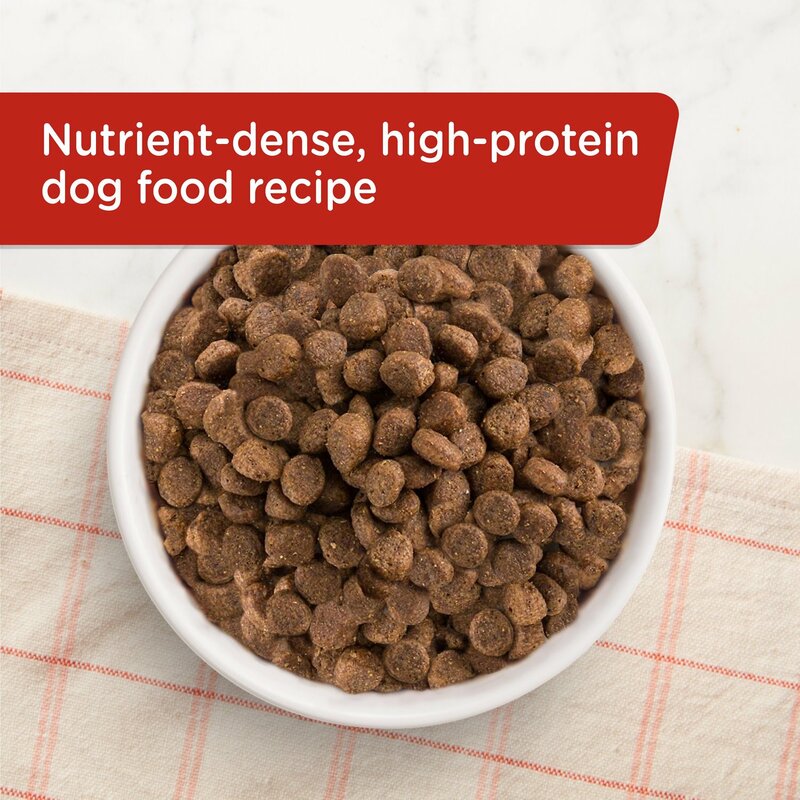 Nutrient-dense recipe with 30% high-quality protein to satisfy your dog's instinctual cravings. Real U.S. farm-raised beef is always the #1 ingredient, combined with protein-rich venison, lamb, and essential nutrients. With 30% high-quality protein, it will help your pup stay satisfied and full of energy. The high-quality proteins provided in this formula provide essential nutrients to help support healthy organs and lean muscle mass. Chicken fat, whole flaxseed and menhaden fish meal are naturally rich sources of Omega 6 and Omega 3 fatty acids, which help support healthy skin and coat. Beef, Chicken Meal, Dried Peas, Whole Dried Potatoes, Pea Flour, Pea Protein, Chicken Fat (Preserved with Mixed Tocopherols), Lamb Meal, Whole Flaxseed, Pork Gelatin, Venison, Lamb, Menhaden Fish Meal, Dried Plain Beet Pulp, Natural Flavor, Sweet Potatoes, Cranberries, Salt, Zinc Proteinate, Vitamin E Supplement, Iron Proteinate, l-Ascorbyl-2-Polyphosphate (Source of Vitamin C),Choline Chloride, Manganese Proteinate, Copper Proteinate, Niacin Supplement, d-Calcium Pantothenate, Biotin, Sodium Selenite, Vitamin A Supplement, Riboflavin Supplement, Thiamine Mononitrate, Vitamin B12 Supplement, Calcium Iodate, Pyridoxine Hydrochloride, Vitamin D3 Supplement, Folic Acid. Metabolizable Energy (ME) 3,635 kcal/kg; 338 kcal/cup as fed. 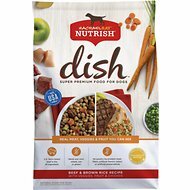 Because Rachael Ray Nutrish may offer different ingredients than your dog is used to, it may take up to 10 days for your dog's system to become acclimated to Nutrish. Slowly mix with his other food over a five- to ten day period until your dog is solely eating Nutrish. Rachael Ray certainly knows how to cook for people, but she also knows what gets her doggie fans' taste buds going. 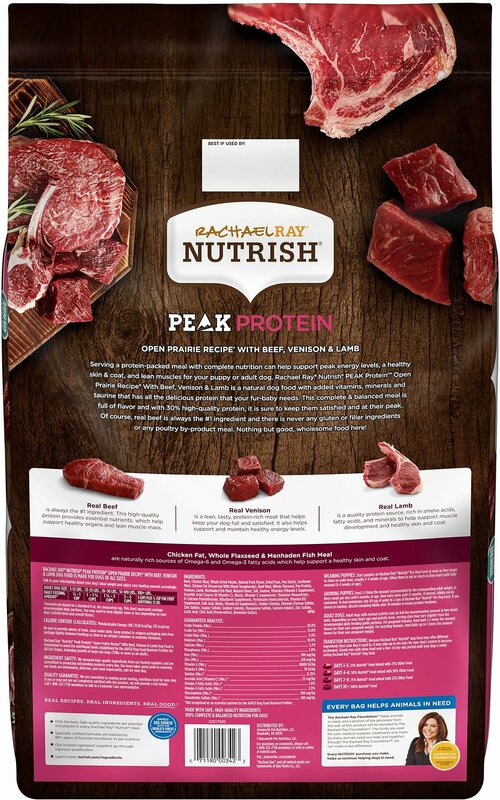 Nutrish Peak features tasty dry food meals that are packed with real meat to satisfy your dog's wild side. He'd better come to the dinner bowl with an appetite, because each recipe has at least three delicious meats with a side of sweet potatoes to satiate his natural cravings. These robust recipes come from Rachael Ray herself, so you know they'll keep your pup feeling full and happy until the next meal. Open Range is the kibble of choice for dogs that really go for red meat. It's got U.S. farm-raised beef mixed with venison and lamb from the grasslands of New Zealand—the perfect combo for true meat lovers. For furry friends of fowl, there's Northern Woodlands, a delicious dry food with U.S.-sourced turkey plus rich game meat from duck and quail. 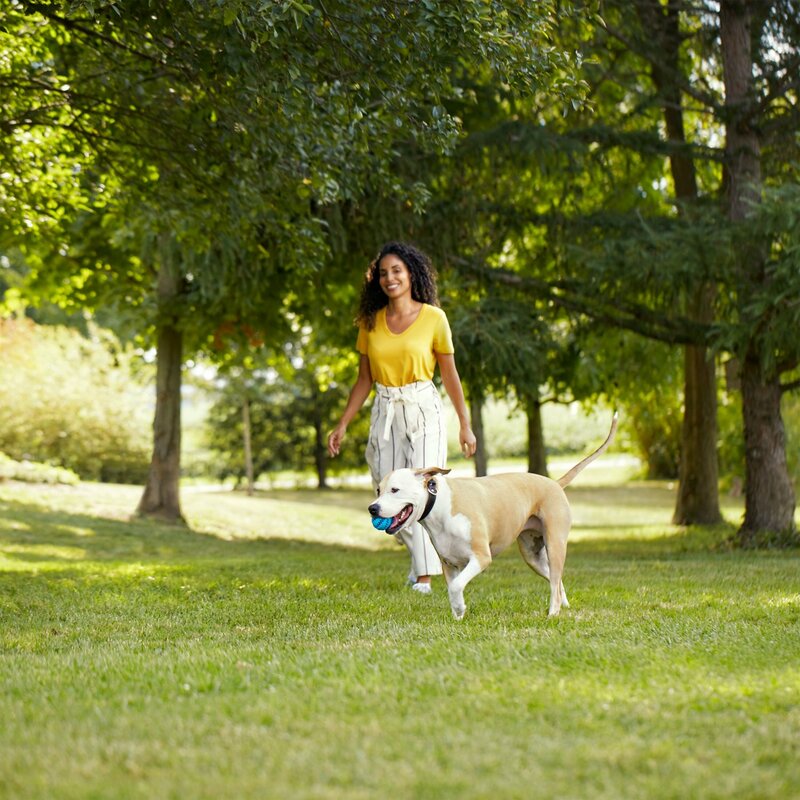 Aside from appealing to your pup's palate, Nutrish Peak provides the nutrients your dog needs to stay fit and healthy. With 30% protein in each bag, these formulas support healthy organs and muscle development, help maintain lean muscle mass, help sustain ideal energy levels, and nourish the skin and coat. Multiple animal proteins serve as natural sources of essential vitamins, phosphorous, iron and amino acids. We have two English Cocker Spaniels (which are small-medium dogs; 25-30 Lbs). Neither one of them liked the smell of the food. They walked away and circled around. They are usually very enthused eaters.The pieces in this dog food were very small. Our dogs had trouble picking up the pieces. They spit out several pieces. I figured I'd try again, but the second time they would not eat it at all. My babies actually LOVE this stuff more than any other food I have ever purchased. I feel so good when they jump around excitedly while I'm filling their bowls. And I feel even better knowing that with Rachael Ray I am getting nutritionally superior food than the more expensive, so called "better for them" brands. I bought this because my 1 dog seems to have allergy to chicken. My dogs really like it but it is tough for them to chew, the food size is larger than it appears. If food size was smaller I would continue to purchase, they really enjoyed it but because of the size of the bites I would not recommend for smaller & toy breeds. 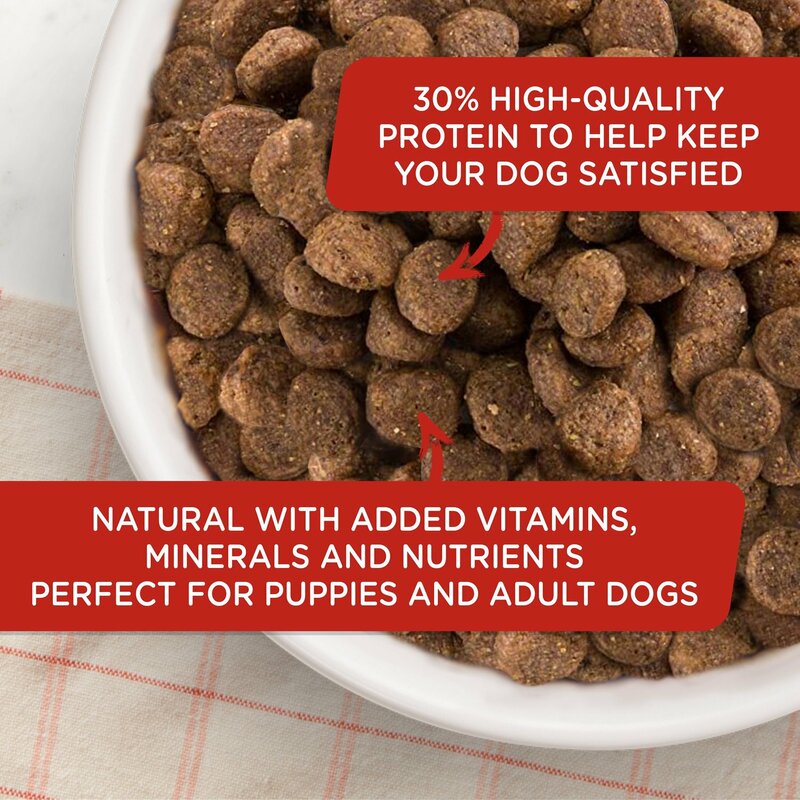 We switched from this food because it was tough to find in the larger bags and my dog was growing out of her puppy diet which was (TEN CUPS A DAY). Now she’s back to reasonable feedings and she is so much happier on this food. It’s clean, real food and it shows in her eyes, coat, demeanor, and TMI- her poo. Henry the Husky Loves the Open Range! When I adopted Henry (Siberian Husky) 3 months ago he was 18 months old and very thin in his hind quarters. Henry has filled out nicely adding 6 lean pounds and his coat is extremely soft and shiny. My Son has a Pug and my ex-wife has a Queensland Healer. 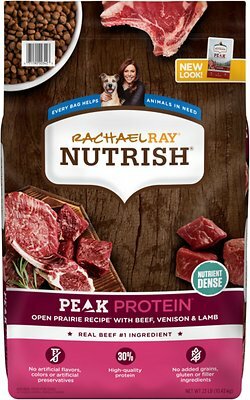 They are very frequent guests and their dogs also love the Rachael Ray Nutrish Peak Open Range recipe. My 1 year old lab has been eating the Rachel Ray chicken formula (the one that came in the green bag) until he suddenly stopped and no matter how much I dressed it up he wouldn’t touch it. After numerous vet visits it turns out- he’s just a picky eater. In a desperate attempt to get him to eat something I bought 4 different bags of food. The second I put this one down he gobbled it right up and he’s been on it ever since! His bowel movements are consistent and he’s excited about eating again! It is about time I have tried just about all top brand dry dog food, my 5 year old Goldendoodle, Callie would snub her nose @ all the other dog food ,she would eat a bit and walk away. This is the only one she is so eager to eat. Thank you Rachael Ray!!! you have made my good friend sooo happy and that makes me happy. I feel it is a great quality dog food and a very fare price!!!! With our old food brand our dog would be an occasional grazer of his food. I would put 3 cups in there in the morning (he’s a 60 pound retriever mix) and he would make it last throughout the day. Now I put this food in his bowl and it doesn’t last even 30 minutes! I’ve had to start spacing it out now, but he can’t get enough! Highly recommend. The dog walked lazily over to his feeding receptacle and sniffed the new food. He then took a delicate nibble of the first morsel of food. He looked around the house as if to think, what is this new tasting food? He then ate the remainder of the dish and took a nap. My pooches are very fussy and I’ve always fed them Merrick. But for some reason they like Peak more. The actually it the dry. I used to have to “ doctor it up” for them to eat now they just go for it!